It’s time to plan for summer! 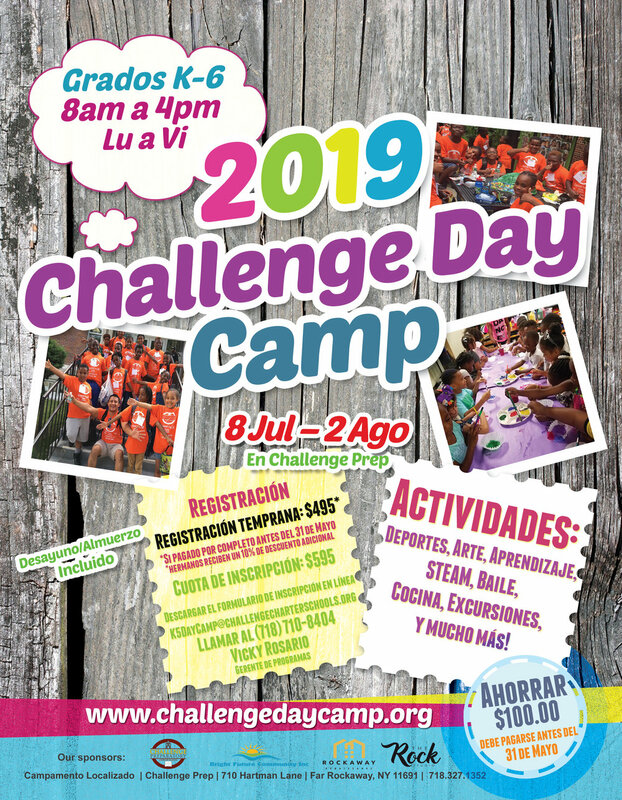 The K-5 Challenge Day Camp (CDC) has been offered for seven years to provide an educational adventure shaped by fun and friends, featuring STEAM, culinary arts, technology, field trips, art, tennis, soccer and lots more! The 2019 will be held July 8th through August 2nd for grades K-5. The highly successful day camp is known for fantastic programming that features field trips, sports, crafts, STEAM activities, and exciting special features including performances by Steve Pennington and Friends for the participants. CDC draws upon the faculty and staff from Challenge Prep as well as the Far Rockaway community to serve as the CDC Team. The regular cost of the camp is $595. You can save $100 by registering and paying in full by May 31st. Siblings receive a 10% discount. Register your child today! It's going to be a great summer at the CDC.